Worthing Thunder’s Zaire Taylor has admitted that his role with the club is constantly changing. 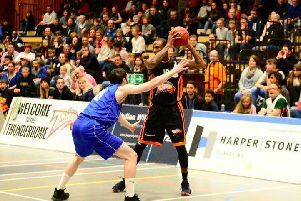 The Staten Island-born swingman has impressed in his maiden season, getting a first triple-double of the campaign in a comfortable 106-75 thrashing of National League Division 1 basement boys Lancashire Spinners on Sunday. Taylor amassed 13 points, 16 assists and 12 rebounds in the win. He currently leads the league in scoring, with an average return of 26.5 points per match. But those impressive scoring numbers have come down in recent weeks, where the American scored 16 points in the loss at Team Northumbria and followed that up with a season-low eight points against Hemel. However with the drop in scoring comes a significant rise in other areas of the statsheet - such as assists - where Taylor dished out a season-high 16 in Bury on Sunday. “My role on the team I feel is constantly changing,” Taylor said. New recruit Marquis Mathis posted 24 points and 14 rebounds on Sunday, while Jorge Ebanks - who arrived in late-October - all scorers with 27 in the win. Thunder skipper Brendan Okoronkwo is also showcasing his skill set on both sides of the court as he is vastly recognised as one of the most skilled British guards in the National League. Next up for Taylor and his team Thunder is Manchester Magic at the Worthing Leisure Centre on Saturday (7.30pm). A game that will certainly test them more than their win at Lancashire but holds the same level of importance. Taylor explained: “I don’t think we’re a team that can overlook anybody. “We’ve shown we can lose to anybody as easily as we can beat anybody. n Sussex Bears were beaten at National League Division 2 strugglers Team Birmingham Elite on Saturday. Second-from-bottom Birmingham managed to secure a 82-64 victory over Bears - bagging just a fifth win of the season for them. Sussex Bears host Thames Valley Cavaliers on Saturday.